Thank you for supporting the 2015 Celebration of Faith - hundreds of people dedicated to passing on the faith gathered together in one room - talk about powerful! Your generosity through the event has ensured that kids throughout Central Washington will have opportunities to learn about Jesus. Ordained a priest of the Archdiocese of Seattle in 1968, Fr. Rowan has served in various academic positions as professor and dean at Seattle University and University of Portland as well as president of Carroll College. 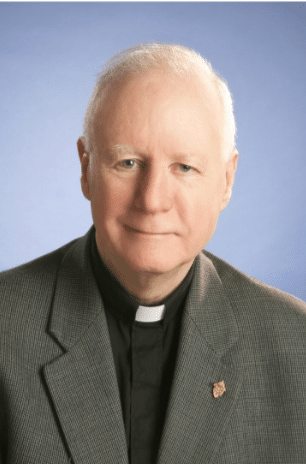 In 2001, while serving as the vicar for education and superintendent of Catholic schools, Rowan assisted the Archbishop of Seattle in establishing the Fulcrum Foundation as a funding source for the K-12 Catholic schools in the Archdiocese. Presently, Fr. Rowan is the Dean of the College of Arts & Sciences at St. Martin’s University in Lacey, Washington in addition to being a Trustee of the University. Other notable honors include the reward for service from the College of Arts and Sciences at Seattle University, an honorary degree in Humane Letters from Saint Martin’s University, the Burlington Northern Award for Distinguished Teaching and the Leslie G. Brooks Memorial Prize. He received an honorary degree from SMU and was chosen as the Commencement Speaker in 2009. "Jesus said “Let the little children come to me, and do not hinder them…” Matthew 19:14 Leading children to Christ is what we do in Catholic religious education programs and schools. It is critical that we accept and continue the mission Christ gave us: to bring our children to Him." "Every Catholic family who wants a Catholic education for their child should be able to get one regardless of ability to pay and every Catholic family should be able to learn about Jesus regardless of their local parishes’ financial resources."